Lots of people suddenly love you when you’re dying. It’s guilt. After Circa announced that it was searching for a buyer to keep the life support machine switched on, sections of Twitter lit up to say how much they hoped the good folk there would find a safe harbour. I’ve met Circa co-founder and CEO Matt Galligan on a couple of occasions. I even set up and moderated a panel including him at the Web Summit a couple of years back. He’s a smart, courteous and good humoured guy with a sharp take on the media. And now I’ve said how much I like the CEO, I’ll proceed to crap on the app from a great height. Circa is beautiful, but it’s like one of those mansions that moderately successful sports people build – a nicely put together facade with shaky foundations. As someone who craves more real reporting in the tech world, apps predominantly built on the concept of human aggregation, chopping up other people’s stories and serving them on a different plate, make me itch with irritation. Circa has done some really interesting things with the news and has broken some stories itself even if it’s primarily an aggregator. The principle that there are other ways to present a story than the established ‘news pyramid’ model is sound. Formats that were created in the print age don’t map perfectly to mobile and there are better ways to do it. 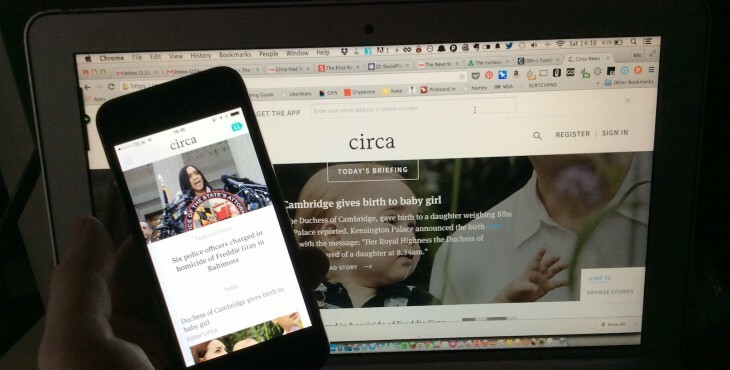 Circa’s idea that you can atomize stories and work with the constituent parts is a good concept. Lots of articles would benefit from having the fat cut away from them. But Circa generates stories with no soul. They’re well-made sausages with no seasoning. What it defines as “facts without the fluff” can also be seen as news without the personality. Most readers want and need more personality, not less. People don’t keep coming back when what they find when they visit is bland. Along with Galligan, Circa’s brain trust includes CTO Arsenio Santos and another compelling media talker, Cheezburger’s Ben Huh. Its roster of investors is studded with big names too – Path CEO Dave Morin (another founder struggling to turn early buzz into lasting relevance), Tumblr founder David Karp, and social media force Gary Vaynerchuk among them. It’s hard not to see the startup as an idea of the news that appeals to a certain strain of the startup and media elite, not a mass of consumers. Circa’s move from mobile-only to also offering a Web service earlier this year now feels less like considering strategy and more like flailing for traffic. The latest whisper is that Twitter is top of the list of potential acquirers. That actually makes sense. Like Circa, Twitter doesn’t make its own news, it’s a conduit for it. Its approach and technology could certainly provide the underpinnings of an interesting new way for the social network to summarise all those stories passing across the transom. It would also be a relatively cheap buy for a company with such deep pockets. To return to the meat-based metaphors – Circa’s built a brilliantly efficient new sausage factory, but it’s failed to source tasty ingredients or pin down a reliable recipe. Perhaps an acquirer will be able to get that combination right. In the meantime, I wish the people behind it the best, but am not going to mourn the demise of another stronghold of aggregation over originality.